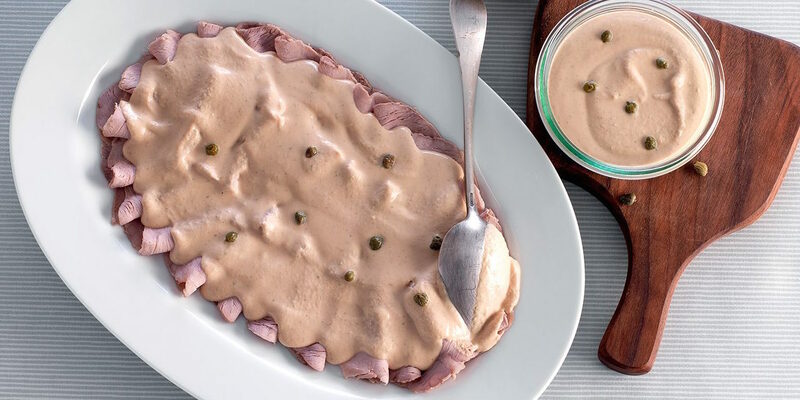 Traditionally served cold as part of antipasti, slices of aromatic veal are served in a rich fish sauce made from tuna, capers and anchovy. Begin by putting the veal in a large saucepan. Add the onion, cloves, bay leaves, sage leaves, celery, carrot, peppercorns and the wine and enough water to cover the veal to the pan. Bring to the boil and then turn the heat down. Cover and simmer for 1 1/2 hours. For the sauce, add the eggs straight into a blender or food processor, add the garlic, mustard and season with salt and pepper and blend. Pour the oil in a thin, very steady trickle when mixing. When all the oil is in, add the white wine vinegar and blend. Then add the tuna, anchovy fillets, capers and lemon juice and whiz again till smooth. Once the veal is cooked, take out of the pan and leave to cool completely before slicing. Or put in the fridge overnight so it is easier to slice. Slice the meat very thinly and arrange in a large, shallow serving dish. Spoon the sauce over the meat. Scatter over a few extra capers and serve.